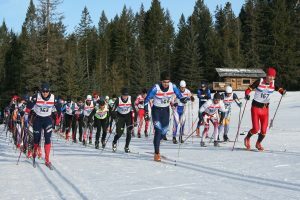 Nipika Mountain Resort teamed up with the Toby Creek Nordic club to host an amazing weekend of Nordic racing. Saturday we hold our classic races. Distances from 30km to 1km will give everyone a challenge. Sunday we hold or Skate races. Distances that day range from 25km to 1km. As usual for our events we round off the day with a great barbecue and draw prizes! Bib and Info pick up at Nipika Barn between 8:00-10:30 a.m. Wave start by category, all competitors will be racing within 15 minutes of the start time. Classic Distances: 1.5, 3, 7.5, 15 and 30K . Join us for a barbeque and awards ceremony after the race at the Nipika Day Lodge. BBQ is included with race registration and additional tickets can be purchased on site. Saturday’s Classic course is 15 km double tracked groomed course, looped once for the 30km race. Sunday’s Skate race is a 10km skate only grooming, looped once for the 20km race.